Do animals get headaches? As our expert notes, some cats do. 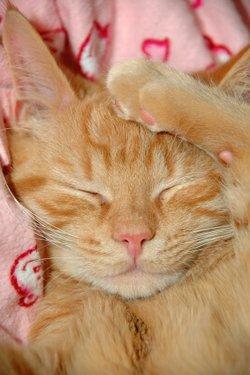 It's possible that cats are susceptible to headaches, especially if they're running a fever. Normal cat temperatures range from 100.5 to 102.5 degrees Fahrenheit (F). Since humans generally around 98.6 degrees F, felines feel warm to our touch. To take a cat's temperature, you may have to go the old-fashioned route with a rectal thermometer - not something most cat owners are willing to do. When cats rub their heads against objects and people, it's usually to mark them with the scent glands located near their ears. It's a cat's way of communicating "This is mine." Although you are the best judge of what is normal behavior for your pet, I don't think you have anything to worry about unless you notice any other obvious signs of illness. If you want to be on the safe side and hopefully gain a little peace of mind, why not schedule a check up with your vet and tell him/her about Sally's recent behavior? There are several tests your vet can perform if he/she feels they're warranted, and early detection is usually key to the successful treatment of most illnesses. My best wishes for your cat's good health~~ Kelly.